Before I could read, my dad read mysteries to me. His favorite authors were Dashiell Hammett and Raymond Chandler. So my first exposure was to Sam Spade and Philip Marlowe, two definitely hard-boiled P.I.s. In my early teen years I expanded my reading list to Sherlock Holmes, Agatha Christie, Rex Stout, Dorothy Sayers, John MacDonald and others—a wide variety of mysteries having detectives with a wide variety of styles. After having read over a thousand mysteries, my favorite has become Robert Parker and his character Spenser, certainly a more easy-going P.I. than Sam and Philip. So when I started writing mystery novels, I realized my own character had evolved in my head, and he was a lot like Spenser. And as my homage to Robert Parker, I named him Spencer Manning. Learning as he goes, Spencer Manning is compassionate, far from perfect, and not afraid to take risks. He doesn’t carry a gun and would rather not fight but will do both if he has to. Highly motivated by what he thinks is right, Spencer follows that path wherever it leads. He is partly who I am, partly who I would like to be, and is my homage to Dad who got me started down this road many moons ago. Part of the fun of writing has been watching Spencer become more confident and better at his job. He has evolved from a new P.I. who wasn’t sure where that path would lead him (Change of Address), into a more experienced detective who still makes mistakes but fewer of them and recovers from them faster. Spencer is a guy you would enjoy having a beer with at your favorite pub and whom you’d want on your side if there was trouble. He’s no Sam Spade tough guy, but he still gets the job done in his own style and I’ve had a lot of fun bringing him to life. and get the latest news and updates from Spencer. 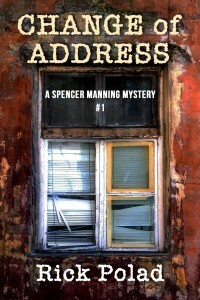 A Drug Affair, the seventh Spencer Manning mystery, set for release. Book Seven – Too Many Suspects!